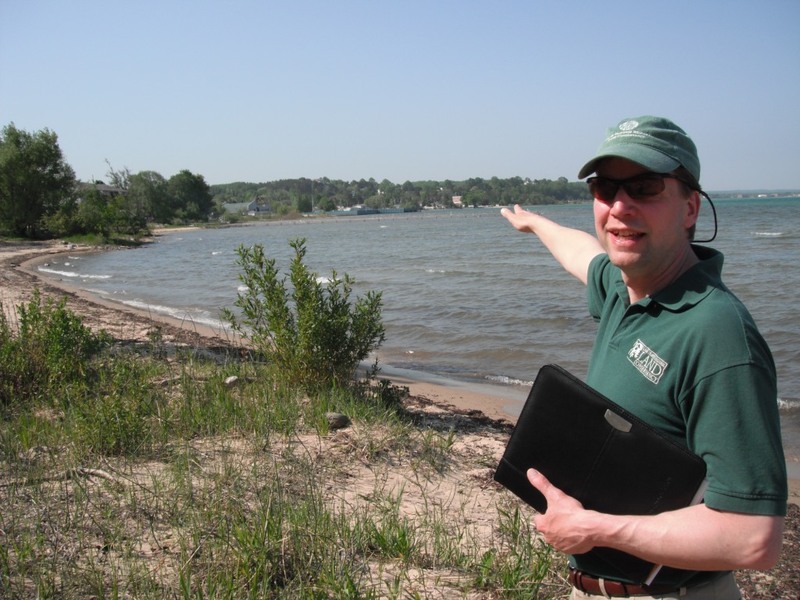 If you're among the hundreds of thousands of people who get an opportunity to spend a little time each summer in Traverse City, you have probably recognized the impact of Michigan's decade-long recession along East Grand Traverse Bay. For many years, the little community of Acme included a bustling community of mom-and-pop motels and upscale shops greeting travelers as they rolled along East Bay. But in recent years, some of those shops have closed and some of the motels have fallen into disrepair. And the old Mountain Jack's Restaurant next to the marina -- a monument to Michigan's late-20th century prosperity -- sits dark and vacant. "Everyone was writing off this stretch of road," says Glen Chown, executive director of the Grand Traverse Regional Land Conservancy. "But it's going to be the new gateway into Traverse City." Three of those old motels were flattened and carted away, revealing acres of new beach. Next, community leaders organized into the Acme Shoreline Committee have their eyes trained on removing the Mountain Jack's building and another motel. With the help of some $6 million in state Natural Resources Trust Fund money and matching funds from a wide range of regional sources, Acme seeks to open up thousands of feet of new beachfront for public use. "We took this on in a difficult economy," Chown points out. "And that's the metaphor for Michigan. This whole state needs to do what Acme is doing ... be bold as we transform into a new economy." Over the past 20 years under Chown's leadership, the Grand Traverse Regional Land Conservancy has preserved more than 35,000 acres through conservation easements and acquisitions of public preserves and park lands. Those new jewels -- check 'em out here -- are undiscovered country for many hard-core visitors to Traverse City's more well-known beaches, festivals and lake life. The "fudgies" (as northern locals have long called the tourists) drive right by incredible public lands without ever noticing what is just steps beyond the car door. Consider, for example, the Yuba Creek Natural Area. What Chown calls "our local Grand Canyon" is just five minutes north of the main intersection in Acme, yet it features a wide valley with a creek running through it and an eagle's nest ... it's a hike reminiscent of Montana. A couple minutes further up U.S 31 is Maple Bay Farm and Natural Area, a half mile of open and often empty beach lined by old cedars. Wander out there and you can have the turquoise waters and plenty of solitude for free. But as Chown is quick to point out, this isn't just nature for nature lover's sake. This is about using differentiated regional assets to grow a regional economy. "We know what our key asset is," Chown says, pointing out into the blue bay. Leading Traverse City companies such as Hagerty Insurance are using the region's natural resources to compete nationally for top talent. And along U.S. 31, a company called Shoreline Fruit has ambitions for an $8 million expansion as a worldwide supplier of dried cherry products. The business plan will require several dozen local workers and up to 50 million pounds of cherries a year. It can only happen if that there's a clear supply chain to local cherry orchards -- orchards that have been preserved in perpetuity through conservation easements. "Shoreline Fruits is the same kind of entrepreneurial drive that happened in Michigan a hundred years ago," Chown says. "And it's happening in our back yard. We're going to take this project right up the supply chain and map where the cherries come from and a good part of it is going to come from local farms. "And were going to finally make the connection that land preservation is a business investment in our future."